» Our Benchmade 940 Review – A Good All Around Survival Knife? 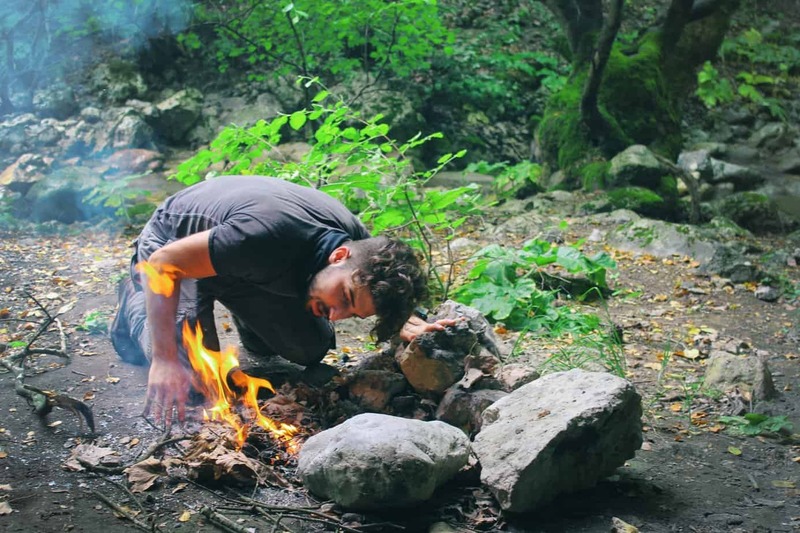 Our Benchmade 940 Review – A Good All Around Survival Knife? Any time you head into the wilds you should have a few essentials with you, and one of the most important is a good knife. It’s a basic and invaluable tool with one function – to cut things – but hundreds of potential uses. Whether you’re cutting emergency tent stakes or dressing a deer, you’re going to need a quality blade at your disposal. No hiker, fisherman, hunter or boater should ever be without one. Bottom Line Up Front: A really good EDC knife, perfect for tactical applications. (For the latest prices and discounts, check here). Sizing: Knives come in just about every size imaginable, from tiny folders to massive belt knives. They all have their uses, but a three to four inch blade is plenty for most tasks; a knife that size is also small enough to carry easily and not too much trouble to keep a good edge on. Fixed vs Folding: The main choice here is fixed or folding blade. If you avoid gimmicks like hollow handles – unless you spend a lot these are always going to be a weak point – a fixed blade is stronger. On the other hand a good folder is strong enough, so there’s not really an issue here; it’s down to personal preference. A folder is a more compact carry for the same blade length though. Handles: There’s a huge choice of materials for handle scales, from leather washers to advanced composites. Traditional choices like wood or horn look great, but modern ones are more durable and usually give a better grip – especially when it’s wet. You don’t want a slippery handle on a sharp knife, so that’s an important factor. Blades: Absolutely nothing takes an edge like carbon fiber steel but some modern stainless alloys come close, and they need less maintenance to keep them in good condition. Fit and Finish: More subjective by nature, this gets at the overall feel of the knife. It’s subtle, but you know it when you feel it. This really comes down to trial and error, but there are some obvious issues that are less subjective like weight and balance. Taking all these factors together we recommend that your primary knife should be a locking folder with a three to four inch stainless blade and a synthetic or metal handle. There are times you might need a bigger knife – for cutting back undergrowth, maybe – but the folder should still be your primary blade and where you spend most of your money. For heavy cutting a military surplus khukri or machete costs less than $50 and will take more abuse than any expensive knife, leaving you with a high quality folder for most jobs. Obviously there are thousands of folders in the size range you should be looking at, and a lot of it is going to come down to personal choice, but if you’re struggling to decide here’s one you should definitely look at – the Benchmade 940 Osborne design. The Benchmade 940 Osborne is a compact folder designed for everyday carry, so a lot of effort has gone into making it as slim and light as possible. In fact picking it up for the first time it seems amazingly light for its size. A close examination shows that what look like green anodized aluminum handle scales is in fact a full aluminum body. The handle is nicely shaped to give a secure grip; the lower edge flares out just below the blade pivot screw and locks the knife firmly into your hand, so even if you’re applying a lot of force there’s not much chance of your fingers slipping onto the blade. The handle material itself is quite smooth and doesn’t seem to have a lot of inherent grip at first, but the anodized finish gives a better hold than you’d think and doesn’t become slippy when it’s raining. Between the finish and the excellent handle shape this is a very easy knife to keep in your hand. The second main component, the blade, is very unusual. The material is conventional enough – S30V stainless with a Rockwell hardness of 56 to 58 – but the shape looks downright weird at first. Benchmade describe it as a “reverse Tantō” and it does look a bit like the classic Japanese blade turned upside down; the point has the same very steep clip, but instead of angling down as part of the cutting edge it angles up to meet the spine. British knife lovers might say it’s more of a modified sheep’s foot than a reverse Tantō. The spine has been reshaped from either of those designs though; there’s a long, shallow clip in it, combined with a false edge. The effect of this is to eliminate some weight but leave more metal close to the tip, which as a result is very sturdy. There’s a good thickness of steel extending very close to the point, so this is definitely not a fragile blade. It seems easy to maintain, too; there are no complex recurves to make sharpening tricky, just a long straight edge that curves gently up in the last inch to meet the tip. The S30V steel is famously tough, and holds a sharp edge better than most stainless steels do. The blade and handle are held together with a recessed hex bolt – four smaller ones keep the two halves of the handle together. The inside of the handle around the pivot screw is lined with steel plates for wear resistance, which is a nice touch; the notched edges of these plates add a touch more grip to the handle’s flare and on the top of the handle, right where your thumb sits when you’re whittling. If you do get any play in the blade you just have to tighten down the hex bolt to eliminate it, but it’s tough enough that this isn’t likely. Just above the main bolt on each side of the handle is a slot for the Axis Lock mechanism. This engages automatically when the blade’s opened, and to unlock it you just pull back on the button on either side of the knife. It’s a very positive system and locks the blade rigidly when in use. Opening is slick and fast too; the thumb studs are large enough to catch easily, and you can very quickly get the blade out with one hand. The 940 doesn’t have a lanyard hole, but it does have a belt clip. This is attached with three small screws, and both sides of the handle are dilled for these; you can easily transfer the clip to your preferred side. Overall this is an extremely well made knife, with all the parts fitting together neatly and the lock functioning very well. 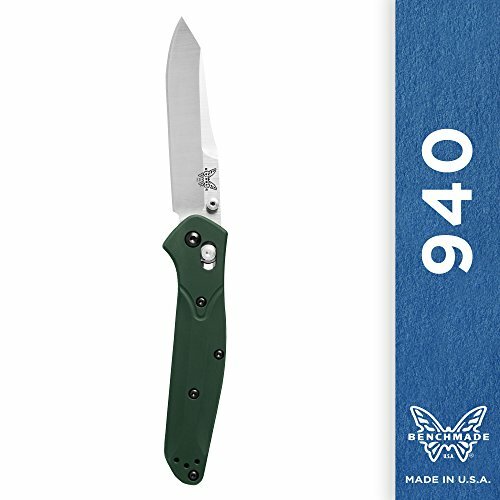 At this price – expect to pay around $180 (For the latest prices and discounts, check here) – you expect real quality, and the Benchmade 940 delivers it. It’s also remarkably light and slim for a blade this size, and the design makes for about the longest cutting edge that could be fitted in. This is an excellent general purpose knife that makes light work of most jobs, and the tip shape means it can punch through heavier materials than almost any other blade this size we’ve ever used. It’s pretty much perfect as an EDC knife, and paired with a khukri or ax will also be perfect for any outdoor activity. A good folder should be simple but reliable and that’s exactly what the 940 is; there’s been no attempt to pack in unnecessary features, just a well thought out design process that’s created a tough and dependable tool. Verdict: An excellent design that does exactly what you need a folder to do. With one of these in your pocket you’re ready for just about anything. (For the latest prices and discounts, check here). 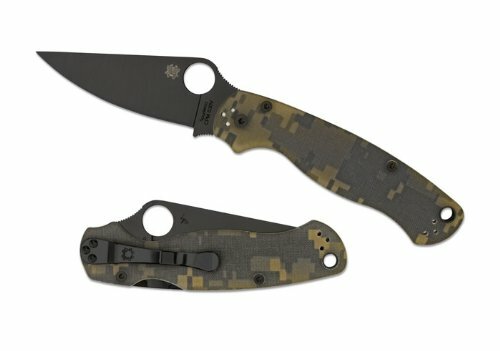 Spyderco Para Military 2 – This has almost exactly the same blade length as the Benchmade 940 but it’s a radically different shape. If the reverse Tanto isn’t for you, this could be a great alternative. It does cost a bit more though, and the G10 composite handle doesn’t fit so nicely in the hand. 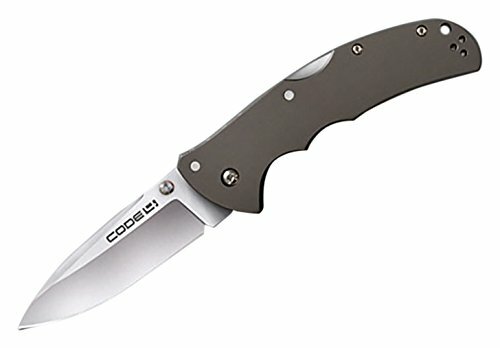 Cold Steel Code 4 – The Code 4 has a very sturdy 3.5 inch blade, available in clip or spear point. The handle is anodized aluminum, not quite as comfortable as the 940, but if you don’t like the Axis Lock for some reason this one has a back lever lock. 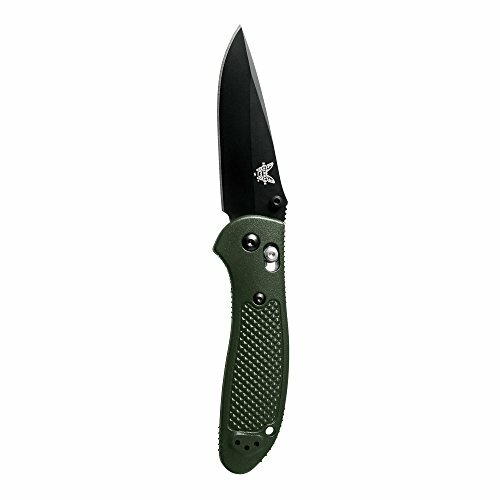 Benchmade Griptilian – This is a great lightweight alternative, also good for everyday carry. Very similar in many ways to the 940. You can read my full review of it here.